One legend tells that onyx is nothing but Aphrodite’s cut nails, turned by magic into a semi-precious mineral. If that’s true, we can conclude that the goddess adored bright colors, and onyx is famous for its variety of colored layers. The location of these layers isn’t uniform. Nevertheless, the layers are neatly parallel, thus allowing the gem to have a wonderful picture. When looking at this stone, one involuntarily starts fantasizing. 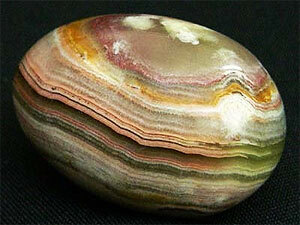 Here, you see how a rocker of the rainbow hardened and crumbled into pieces as huge crystals of the mineral onyx. Abstracting from legends and beliefs, scientists have discovered that the width of the vast majority of these bands depends on the temperatures at which the mineral formed. The coloration is formed due to the influence of certain impurities in the rock’s composition. These may be chalcedony, iron, chlorides as well as many other items. 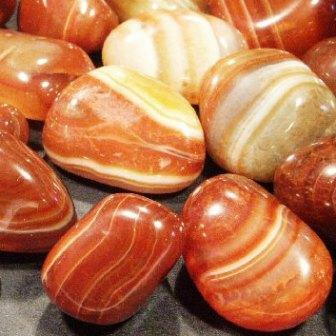 Sardonyx is a kind of onyx, which has an orange-red or brown hue. A mineral of the saturated, but translucent black color with white, almost imperceptible strips is highly valued. Along with this type, red onyx is also considered rare. Despite its relatively high cost compared to the stones of other shades, the black mineral is often found in jewelry. 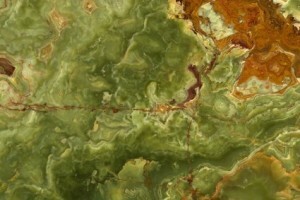 Marble onyx can hardly be called a variety of onyx, because the chemical composition of this rock is somewhat different. It’s formed by stratified deposits of certain substances in the areas with thermal springs and caves. 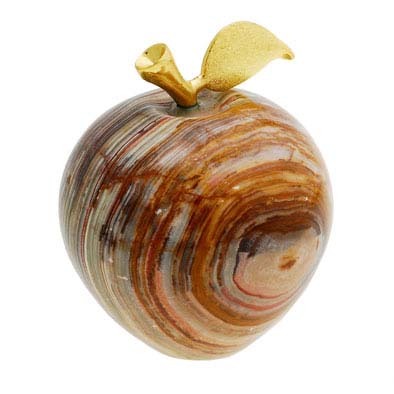 Due to the peculiarities of education, marble onyx also features layering. Copper and magnesium in the composition of this stone, paint it in dark shades of green, while iron with copper make it light green. One can come across minerals of yellow, brown and red hues, which are obtained due to the influence of the iron oxides. Any shade of the mineral onyx is very beautiful and unusual due to its outstanding banding. The stone looks cute in rings, earrings, pendants and bracelets. Its properties are greatly enhanced when it’s inserted into a silver frame. Lots of beliefs are connected with this stone: with either positive or negative connotation. The whole East considers the stone unlucky and does its best to avoid even the physical presence beside it. The only exception is India. In this country, the mineral can be considered a favorite. We see rather a different attitude in the European part of the world. The French call this rock “a stone of light and truth”. In many churches you can admire the entire walls faced with this mineral. Moreover, it was also used to manufacture religious attributes. The magic properties of the stone were positively taken in Ukraine. It was believed that having drunk from the cup made of onyx one can recover from any exhausting ailment. Whatever various nations treat the same stone, one thing is clear: all of them have always recognized the existence of certain properties in the rock that can’t be explained from the scientific point of view. Sorcerers noticed that too (perhaps they were one of the first). They started to actively use the magical properties of the stone in certain ceremonies. Today every black magician conceives it his duty to grab a ritual product with onyx. The black mineral boasts special energy. It’s not necessary to use it in magical rituals. Of course, this gem shouldn’t be called a stone of evil. Amulets and talismans with an insert of the stone of this color can only serve for the benefit of their master, and the power of their positive effects is directly proportional to the kindness of their owner. Who Needs Such a Gem? As our ancestors have discovered, the magical properties of this stone are very strong. It has been long used for curative and magic purposes. An ability to boost spirits in a difficult period of life, raise self-esteem after a traumatic event, recover the lost strength after a hard diseases is successfully used by representatives of most of world nations. The green mineral is often used for therapeutic purposes. Its life-giving color helps to improve the overall tone, thus giving a beneficial effect on general health. It’s an evident fact the stone of the green hue positively affects men’s potency. As a mineral, which helps to regain strength in the postoperative period, marble onyx with a great content of calcium is valued. The stone treats the owner’s vital energy very gently. It will never let him or her spend it in vain. The given property has become topical in recent decades, when hyperactive kids drastically grew in number. Desperate kids purchase an amulet with onyx for their scions, but that doesn’t give expected results due to a definite mismatch of the stone to kids’ horoscope. When picking up a stone considering the sign of the zodiac, one should keep in mind that it’s mainly suitable for Virgo, Capricorn and Taurus. The mineral helps Virgo people to open freely and not to restrain all their emotions in themselves, so when they want to share them. In relation to Taurus, the gemstone has rather an opposite effect. The gem helps representatives of this sign to suppress those feelings, which interfere with their work. As a mascot for Capricorn, onyx ensures the rapid achievement of goals. 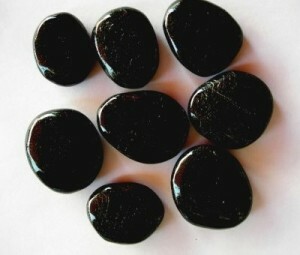 The mineral of the black or white color, is absolutely contra-indicative to Gemini. The black mineral suppresses their vitality, while the white one can even make them unhappy. Taking into account the stone’s magical properties, one can make a clear conclusion that it’s suitable for everyone. Just consider the color of the mineral and its sign of the Zodiac when picking up your gem.